Eagle Superabrasives manufactures glass grinding wheels that are specifically designed to cut ceramics and glass cleanly and efficiently. What sets our glass grinding wheels apart is the attention we pay to the bond systems. We typically use metal bonds on our wheels because of the bond’s propensity to be extremely abrasion resistant. The grinding residue produced while grinding glass and ceramics can erode most resin bond systems, shortening the wheel’s life. Metal bonds are ideal for grinding refractory ceramics for this reason. However, resin bonds can be beneficial for grinding harder, finer grain ceramics and cutting glass. The bond is ideal for cutting very thin glass tubing and achieving a chip-free cut. The softer bond system constantly exposes the diamond particles, which ensures a clean cut every time. At Eagle Superabrasives, we make our glass grinding wheels to order. We can manufacture a variety of different wheel shapes and levels of hardness. Our glass grinding wheels are ideal for cutting and grinding all kinds of fragile material, including stem wear, optical glass, mirror and sheet glass beveling, laminated glass and even scientific glass. Our wheels are great for expertly cutting glass tubing for lighting and medical industries where a consistently clean cut is necessary. When grinding, work under a flood coolant to help remove the grinding swarf from the air. It also helps to prevent loading or clogging the wheel pores. 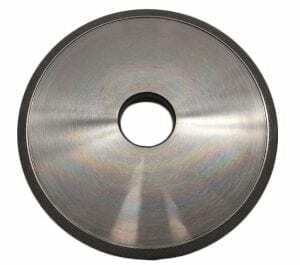 If you’re in the market for glass grinding wheels, look no further than Eagle Superabrasives. Our quality products and superior customer service have made us a premier supplier of superabrasives in the United States. Contact us to place your order for custom glass grinding wheels today.